A friend has experienced the death of someone they loved. You want to help but are not sure how to. This article will give you ways to turn your cares and concerns into positive actions. Being an active listener is the most important way to lend support. Your presence and desire to listen without judging are critical helping tools. Don’t worry about what you should say. Concentrate on listening to the words spoken by your friend. Your friend may relate the same story about the demise over and over again. Listen attentively each time. Realize this repetition is part of your friend’s healing process. Simply listen and understand. Give your friend permission to express his or her feelings without fear of criticism. Learn from your friend; don’t instruct or set expectations about how he / she should respond. Never say, “I know just how you feel.” You don’t. Your role should be someone who “walks with,” not “behind” or “in front of” the one who is mourning. Allow your friend to experience all the hurt, sorrow and pain that he or she is feeling. Enter into your friend’s feelings, but never try to take them away. Recognize tears are a natural and appropriate expression of the pain associated with the death. Keep in mind that your friend’s grief is unique. No one will respond to the demise of someone loved in exactly the same way. While it may be possible to talk about similar phases shared by grieving people, everyone is different and shaped by experiences in their own lives. Be patient with the grief your friend is feeling. The process of grief takes a long time, so allow your friend to proceed at his or her own pace. Don’t force your own healing timetable. Don’t criticize what you believe is inappropriate behavior. You should try to create opportunities for personal interaction but don’t force the situation if your grieving friend resists. Preparing food, washing clothes, cleaning the house or answering the telephone are just a few of the practical ways of showing you care. Just as with your presence, this support is needed at the time of the death and in the weeks and months ahead. 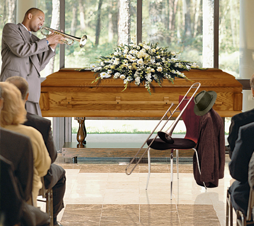 Your presence at the funeral is extremely important. As a ritual, the funeral provides an opportunity for you to express your love and concern at this time of need. As you pay tribute to a life that is now passed, you have a chance to support grieving friends and family. At the funeral, a touch of your hand, a look in your eye or even a hug often communicates more than any words could ever say. Don’t just attend the funeral and then disappear. Remain available in the weeks and months to come. Remember that your grieving friend may need you more later than at the time of the funeral. A brief visit or telephone call, in the days that follow are usually appreciated. Sympathy cards express your concern, but there is no substitute for your personal written words. What should you say? Share a favorite memory of the person who has passed. Relate the special qualities that you valued in him / her. These words will often be a loving gift to your grieving friend, words that will be re-read and remembered for years. Use the name of the person who has passed away either in your personal note or when you talk to your friend. Hearing that name can be comforting, and it confirms that you have not forgotten this important person who was so much a part of your friend’s life. Your friend may have a difficult time during special occasions like holidays and anniversaries. These events emphasize the absence of the person who has passed. Respect this pain as a natural extension of the grieving process. Learn from it. Most importantly, never try to take away the hurt. Your friend and the family of the person who passed away sometimes create special traditions surrounding these events. What is your role? Perhaps you can help organize such a remembrance or attend one if you are invited. Remember that the demise of someone loved is a shattering experience. As a result of this demise, your friend’s life is under re-construction. Consider the significance of the loss and be gentle and compassionate in all of your helping efforts. While the above guidelines will be helpful, it is important to recognize that helping a grieving friend will not be easy. You may have to give more concern, time and love than you ever knew you have. This effort will be worth it. By ‘walking with’ your friend in grief, you are giving one of life’s most precious gifts–yourself.